Is your Mustang window regulator worn out? Does your window roll down all by itself while you are driving down the road? This is a common problem with an old window regulator on a classic Mustang and it could possibly allow someone to enter your vehicle simply by pushing the window down. 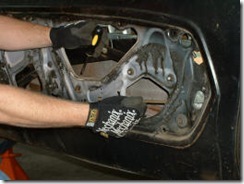 This article and video will demonstrate just how easy it is to replace a worn out window regulator on a 1967 Ford Mustang. Before you can remove your old window regulator you will need to remove the window handle, door handle, arm rest pad, door panel and water shield. You will also want to disconnect the door latch rod from the door handle shaft so it will be out of the way during removal and installation. 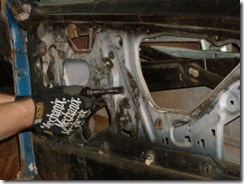 With a door panel removal tool or in my case a plastic putty knife, remove the door panel. 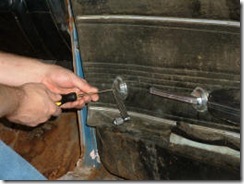 The door panel is held on with a series of door panel clips; you should put your removal tool as close as possible to the door panel clip to leverage it out of the clip hole leaving it attached to the door panel taking care to make sure that you do not break the clip away from the door panel. 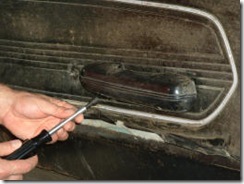 Roll your window up all the way and then disengage the door latch rod retainer from the door handle shaft, this will get the rod out of the way so you can work more comfortable. you will also have to remove the screw that hold the rod support clip so the rod will drop out of the way. Roll down your window so it is about 3/4 of the way up; position it so you can see the three screws that hold the window track to the window frame through the round access holes. Positioning the window here will allow you to get a visual on the rear and front edge of the window track through the access holes and will be important when removing and reinstalling the window regulator. Now that your window is in a good position to remove the window regulator you should secure the window to the vent window frame with some duct tape as shown in the photo. Securing the window to the vent window frame will not only save your forearm it means that you do not need an assistant to stand there and hold up the window while you do the replacement. You can now begin removing the window regulator from the door. First start by removing the door window guide track from the door. 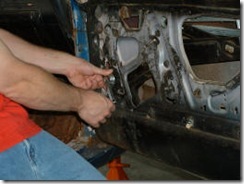 After you remove the nuts you will be able to slide the track off of the window guide and remove it from the door. Next remove the two bolts just above the door handle shaft. These two nuts secure the window regulator to the door. Finally remove the last two bolts that secure the window regulator to the door, they are located above and below the window crank shaft. 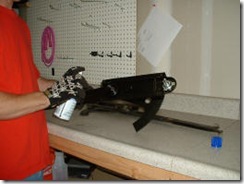 The last step is to slide the upper window regulator guides off of the window guide track. The procedure will take a bit of maneuvering and will require some patients. Push the window regulator into the door so the window crank shaft clears the shaft hole allowing you to move the window regulator around in the door. 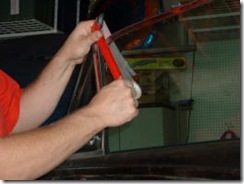 Maneuver the window regulator up and forward so you can slide the front window guide off of the window guide track. Once the front guide is free you will then maneuver the window regulator toward the back of the door so you can slide the rear window guide off of the track and remove the window regulator from the door (watch the video to see this demonstrated). Before installing your new window regulator you should do a little preventative maintenance to ensure that your new window regulator has a long life and functions properly for years. The coiled spring should be greased with lithium grease from a tub or a spray can. 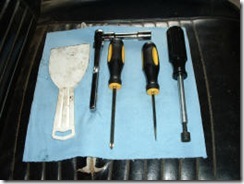 You should also grease the window guides and the crank shaft gear. When you remove you old window regulator you may notice that sliding the rear window guide off of the window track was pretty tough because its a really tight fit in that area. To make installation easier and less frustrating you may want to file off and round the corners of the window regulator arm in that area, this will give you that fraction of space needed to make installation go smoothly. Hi! Great job on the video! I liked watching it and it looked like you did a good job on the car. You’re website is cool and keep it up! It is about time someone came out with an informative tool to help the do it yourselfer. Not only do you explain how to with text, pictures, and video but you tell what tools are needed as well as list and offer the parts (on AAPD.net) to do the project! AAA+! Thanks for the help! What’s the best way, and any tools needed/suggested, to get the door panel back on? I have a 67 convertible and the door panel has a lot of those door panel clips. My email is wil@wilbell.com. Thanks for a very helpful video. The best way to get the door panel back on is pretty easy. 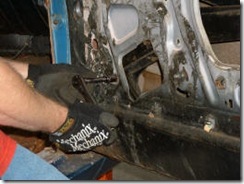 The most important thing is to make sure that the door panel clips are situated properly so they will go into the holes in the door correctly. Take you time lining up the clips and double check before proceeding. You can use you hand or a flat broad surface like a clip board, line up the clip and then give the panel a good solid blunt push; the clip should engage the hole if everything goes well. nice article. do you know where to find an exploded type view of the quarter and door window mechanical? It sounds like you may have a window roller on the regulator that is broken off. If you have 65-66 Mustang then you can just purchase a new roller and clip, if you have 67 and up you will need to replace the regulator. Thanks for the article. It really helped with my project. Something I wanted to add though: since I didn’t want to salvage the existing regulators, I just drilled-out the rear roller that’s so difficult to get our of the track. Filing the new regulator was THE tip that saved me hours. Thanks again. great article, but I am having a problem getting the door handle shaft lined upcenter of the door handle shaft hole, am i suppose to take the tracks off?? Fortunately I found your website. Really good articles…I have just imported a 66 convertible from the US (to Switzerland) and was checking out the the window regulators as it seems they need replacing. But now I have a problem with the catch mechanism for the door. The rod on the inside has become detached from the handle push-button and I have no-idea on how to get this back into place. I guess the same situation would happen when I remove the door handles for repainting the doors. Can you point me in the right direction on how to sort this out? Both the door latch and lock rods attach with a door latch rod retainer; part number C3AZ-6221952-BR It sounds like the rod retainer in your Mustang either broke or has just detached; getting it back in place is simple, all you do is push the clamping end onto the rod. My windows seem very difficult to raise, must use to hands,(one to crank the other to lift the window). Coming down they are reasonably manageable. I then purchased and installed power lift mechanisms and they are the same. Everything is lubed and straight, any suggestions? It sounds like you need to replace the window regulators. After many years of use the regulator will where out and become difficult to operate especially when rolling up, and when going down its very easy and eventually your window will roll down on its own while driving. Just wanted to say thanks for the video! After reading all kinds of different methods to remove the regulator, yours was the easiest! Actually seeing it happen made it easier to understand. I found it easier to drill out the rivets holding the rollers, than sliding it out. When I installed new power regulators, I cut open the top of the window tracks with a dremel, which gave just enough room to slide the roller in. While all that is out, it’s a perfect time to replace the weatherstrip at the top of the door, and to tighten up the door handles. You definitely need to replace the window regulator. 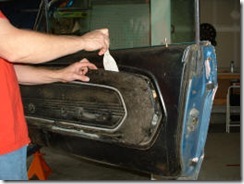 hi joe i have a 67 mustang coupe & the rh window is very stiff to get up and down. i take it is the regulator. It sound like you need to replace your window regulator. Sometimes the regulator will get really sloppy or it can become really tuff to roll up and down, its time to replace those worn out window regulators. The window regulator replacement for a 65 or 66 Mustang is similar to the procedures on the 1967 Mustang, however the 65-66 has a regulator and scissor assembly that detach from each other that make replacement a little bit easier. On my 66 HT, I cannot get the front of the door window aligned with the roof so there is a 1½ inch gap. The back of the window can reach it place. Any suggestions ? If new window channel strips are installed they typically put the squeeze on the glas frame is it nears to top edge of the door; work with it. The other possible reason is the stop bracket on the window frame of glass run that needs to be adjusted. Take your time, loosen things up and then try to roll it up. On my 67 Fastback, both window roll up and down properly except they stop when they are about 3/8″ to 1/2″ from fully up position. Is there an adjustment? Is it maybe incorrectly installed? There are two things that will prevent your windows from rolling all the way up. The first thing could be that the window stops are set too low and need to be adjusted to let the window go all the way up, the stop is located at the back of the door at the vertical window guide. The other most common reason is new window channel strips that have been installed. This is a common problem since the area is now squeezed smaller with the new strips in place, the bottom of the window frame hangs up on the new strips not allowing the window to go all the way up easily; you could force it but this could cause the window channel strip to come loose. If it is the strips I would recommend installing very tiny sheet metal screws at the back edge of the strips to make sure that they do not come loose when rolling the window all the way up, roll the window all the way up and let this area decompress for a while to help loosen things up. Thank you for the info, I am going to look for the stops to adjust. (I am missing the window channel inner strip on both doors which I have bought and just have to install, because there should be lots of clearance, I don’t think it is that, I will check to be sure) Is the stop you talk about located at the rear vertical channel? On the top or bottom? Is it a hex bolt do you just slide it to where you need it and lock it down? I just am not quite sure what to be looking for. Thanks again for a great website!! The stop adjuster for the up position is located at the rear vertical, should be a standard bolt that holds the bracket, loosen it up, roll up the window and then secure it. 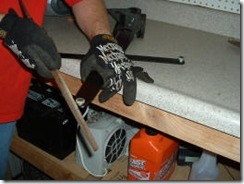 You may have to loosen up all mounting point then give it a roll up and position it, then secure everything. I have a 1991 ford explorer replaced driver side door motor. Can not get the gear up in place where i drilled the rivets out can you help. Since you cant get your window to roll up at all, not even if you give it a helping hand; you will have to figure out a way to get the glass assembly separated from the window regulator. I would start by removing all the attaching hardware from the regulator and then see if you can work the regulator off of the window frame track. reading instructions on changing window regulator. Couple of references to video but I don’t see how to access the video? Any tips on installing a 1966 Mustang door latch bushing? You Have a great website!!! 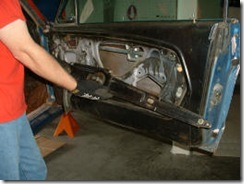 I am working on installing the door glass back in my 66 mustang coupe. The vent window has 2 bolts at the top. One goes in a threaded hole but I cant figure out the other one. All the info I got says a screw / washer assy goes into the odd opening on the vent frame but what does it bolt to. Is it Iam missing something? The prints say they are both adjustment points. 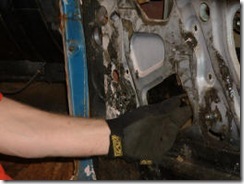 I am trying to remove the window glass and regulator from the door to do bodywork on the door. I cant get the rear of the glass free. Any tips ? there is probably a stop bracket that needs to be removed; also you should remove the window channel strips. 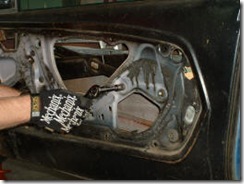 Is there a site that gives step by step instructions on how to take a part the door window glass, channels and regulators on a 1967 Mustang? Mine are hard to roll up and down, I want to clean and lube the entire assemblies. I’m in the process of restoring a 67 Mustang coupe and have misplaced or lost the 6 (3 on each side) screws that attach the window track to the window frame. Do you know where I could obtain replacements? Does anyone out there have a how to video on how to change the bushings on the rear window regulators? I just put my door glass back in this weekend. I had to drill out the 4 screws that attach to the clips and couldn’t find replacements from any of the usual sources. So I took the clips to Lowe’s and found stainless steel screws that are a perfect replacement. 8-32 oval head either 1/2 or 3/4 inch. replaced both door window regulators on 66 mustang. know both windows are about 1/4 from full up. it’s like they are hitting something. I have a 66 mustang convertible, the windows roll up OK but they don’t line up, pass. side is 1″ in at the top compared to the back window. Drivers side is the opposite it is out at the top compared to the rear window. How do you adjust these windows where they meet when rolled up. Thanks for any help. Great video and step by step instructions. Like many others once I was done my window wouldn’t go all the way up. Turned out to be the window seat frame had trouble pushing through the water barrier rubber on the door. I used some “rubber protect” to lube the seal and gently raised and lowered the window through it until it loosened up. The regulator was bad a long time and the window hadn’t gone all the way up in so long the rubber needed some retraining. Works like a champ now. Thanks again for the informative video and instructions. The drivers side window is stuck in the all-the-way-up position. Is there a way to free it without taking the door all apart? Really enjoyed all the discussions on the regulator. That’s the easiest thing to do if you follow the simple directions. Having the window at 80% up helps in getting the sliders back in the top track. It took me twice as long to change my reverse lightbulbs – go figure. They hadn’t been changed in 20 years! 67 Mustang drivers window is stuck all the way down. Window crank will not move at all. Rollers appear to be ok. This window has always worked well with no issue, even the last time it was rolled down. Could something be caught in the crank gear?